Denzel Washington's Eli will smite you. Directed by Allen and Albert Hughes. Starring Denzel Washington, Gary Oldman, Mila Kunis and Malcolm McDowell. Opens Friday, January 15, at multiple locations. Directors Allen and Albert Hughes were raised by an Armenian mother and African-American father. With such a background, it would be difficult not to have feelings about the church. The Hugheses' fourth film, The Book of Eli, centers on the Christianity that was at the margins of their previous films—hypocritically misused by Bokeem Woodbine's bush-crazy marine turned pulpit-pounder turned stick-up man in Dead Presidents, and the sanctimonious grandparents in Menace II Society. "I don't think God really cares too much about us, or he wouldn't have put us here. . . . Look where we stay at." Thus spoke Menace's O-Dog, referring to Crenshaw Boulevard, not so different from Presidents' Vietnam and '70s Bronx, and From Hell's Whitechapel. 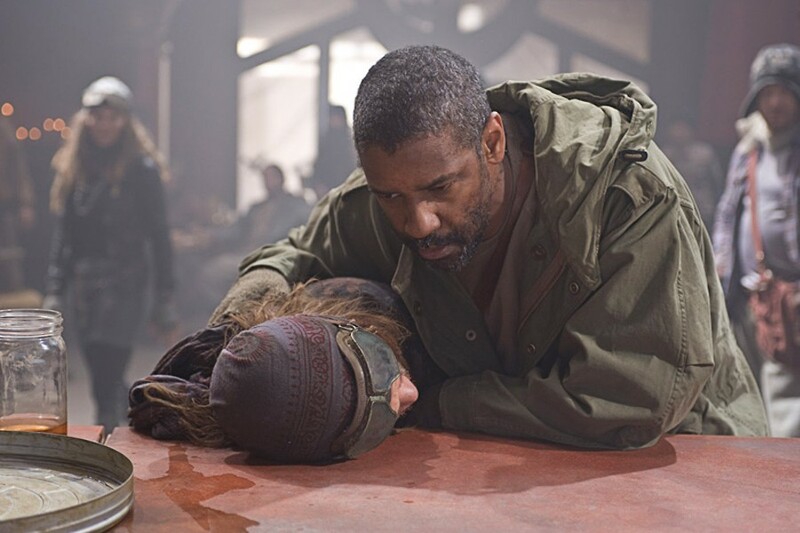 In The Book of Eli, the whole world's a blasted ghetto. It's 31 years after the scorched-earth apocalypse. As in The Road, The End has terminally desaturated the world's palette. Only a few tattered product placements have managed to survive. Denzel Washington wanders endless alkali flats under a leaden sky that never opens up to rain. On the road since Year Zero, Eli has become an expert at using his wickedly quick machete arm to ward off roving bands of highwaymen from his precious cargo: the last copy of the Bible. The other copies have been destroyed as taboo, since religious conflict inspired the nuclear holocaust. That's not impossible to believe, though it taxes credulity that a fragmented society that can't dig freshwater wells has managed to destroy every other copy of the most ubiquitous book in the Western world, undoing all the Gideon's good work. As does the disciple Eli attracting Solara—a badly miscast Mila Kunis, who looks like she's spending a semester abroad in the post-apocalypse from her fashion school's co-op program. As does Eli's zoning out to his iPod during night watches in the hazardous wasteland (a twist-ending revelation makes this particularly ridiculous). It's water and a battery charge that lure Eli down the Main Street of a repopulated ghost town. The Hugheses play up the spaghetti-Western element, as Denzel's Stranger strolls into a saloon owned by Gary Oldman, the town's corroded, lizard-like first citizen, Carnegie (neither Dale nor Andrew deserve this defamation). Carnegie is one of the few survivors, like Eli, old enough to remember the lost world. His saloon is the lobby of the abandoned movie theater that he has made his headquarters. Accordingly, he's interested in resurrecting lost forms of mass mind control—Oldman is introduced reading a biography of a great cinephile, Mussolini. It's with cynical messianic intent that he's been scouring the countryside for a Good Book, which sets up a showdown with true believer Eli. The Hugheses once had a black-comic sense to match their guignol impulses (every line of Menace is a potential inside joke). Here, that sense is only evident in a roadside stop-off with some unhinged survivalists, an elderly American Gothic couple played by Michael Gambon and Frances de la Tour. This opens into a firefight showing off the Hugheses' other strength, their allegiance to uselessly beautiful tracking shots, here scuttling in and out of a besieged frame house as it's shot to pieces. The rest of the rote splatter-violence has Denzel whirlwind lopping heads through philistine hordes, sequences only good for insight into what PS3 games the Hugheses were playing in pre-production (screenwriter Gary Whitta's previous credits are, aptly, in video games). It remains to be seen how the clergy, often overeager to accept tribute from popular culture, will receive this gory simony. Nobody reads the Roman Catholic writings of François Mauriac or Pilgrim's Progress anymore, so I guess you take it where you can get it, but The Book of Eli's plastic parable isn't much more advanced than Insane Clown Posse theology. Eli eventually summarizes a lifetime of scriptural study as "Do more for other people than you do for yourself"—an idea hardly unique to Christ—while an ending that combines Fahrenheit 451's Book People and Malcolm McDowell in an insupportable mustache seems to downplay the importance of Eli's cargo. Eli himself resoundingly fails to follow the Good Samaritan's example when witnessing a roadside hijacking; the most that can be said is that he remains chaste without visible effort (ostensible villain Carnegie at least shows an evangelical spirit). Our hero is mostly an Old Testament smiter of the wicked, finally—unless I forget when Christ said, "You lay that hand on me again and you will not get it back" at the Garden of Gethsemane.